Discussion in 'Registrars' started by Prashant Sharan, Nov 27, 2018. The NamesCon 2019 domain name auction is switching to GoDaddy as its auction platform. It makes sense that the GoDaddy auction platform is replacing Namejet as GoDaddy is the owner of NamesCon. 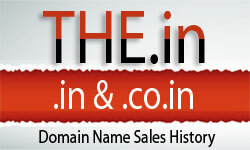 Forums dedicated to Indian domain names, including buying, selling, appraising, developing, and monetizing.